The Waco Mammoth Site has two levels of mammoths. Between these two levels, another event gave us a very different collection of fossils. So far, this intermediate level has produced five ribs from an herbivore, not yet identified, and one very small, very special tooth. The tooth is in storage today, but I recently painted a replica of it, shown top right, which we put on display this week. It's from a baby saber-tooth cat! This cub was less than a year old, and its fang was six centimeters long, root to tip. 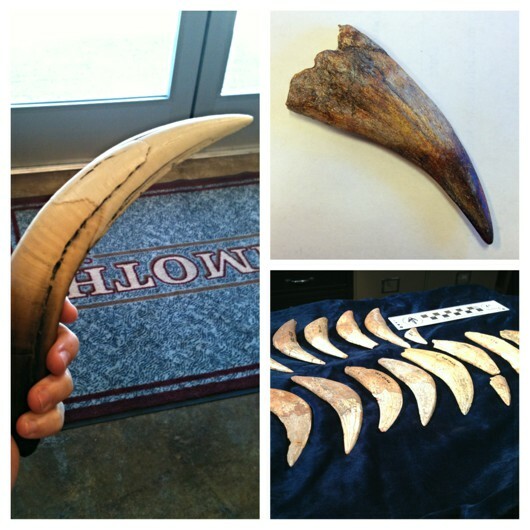 We don't know yet which type of saber-tooth it was. The most famous, of course, is Smilodon fatalis, and some of these ambush predators may have lived in Central Texas. A replica of one of this beast's fangs is shown on the left. The other likely candidate is Homotherium serum, the scimitar cat. This animal had shorter fangs (specimens from The University of Texas pictured lower right) but longer legs, using pursuit instead of ambush. Until more of this cub is found, we won't know which one we have. Either way, I bet it was an adorable kitty. There will be no KT next week, as I will be out of town, helping a friend with research. See you the week after!